The Royal Jordanian Army (Arabic: القوّات البرية الاردنيّة, "Jordanian Ground Forces") is part of the Jordanian Armed Forces (JAF). It draws its origins from units such as the Arab Legion, formed in the British Mandate of Transjordan in the 1920s. It has seen combat against Israel in 1948, 1956, 1967, and 1973. The Army also fought the Syrians and the PLO during Black September in 1970. Arab Revolt Tribal Cavalry – Tribes of Jordan and Arabia, c. 1918. Arab army during the Arab revolt of 1916 against the Ottoman Empire formed the nucleus of the Arab Legion. On 10 June 1916, Sherif Hussien Bin Ali prince of Mecca, officially declared the Great Arab Revolt against the Ottoman Empire to rid Arab nations of the Turkish rule that had lasted about four centuries. On 21 November 1920, Prince Abdullah Bin Al-Hussien (later King) arrived at Ma'an, where he expressed his resolution to drive out the Turkish forces from Syria. Later, on 5 December 1920, he proclaimed himself as deputy king in Syria and appealed to members of the Al-Faissali army to join his forces in Ma'an. His calls received much attention in the Arab world as several prominent Arab nationalists and other Arab princes joined his campaign; these later formed the embryonic force of the Arab legion. Gendarmerie (Darak) force of 400 men. A mobile (mainly cavalry) force of 150 men and horses. A regular Army battalion of some 200 infantrymen. A camelry of 100 men. An Arab force, which was probably the battalion that had accompanied prince Abdullah to Amman from Ma'an. Transjordan Frontier Force: It had played an important role for the United Kingdom during World War II, as it provided protection for British lines of communication extending from Iraq to Soviet Union. It also took part in the fighting against the French forces in Syria. The Arab Legion: – During World War II, it was mainly tasked with maintaining law and order in the country. Moreover, it extended support to British Forces engaged in military actions in Syria, Iraq and Palestine. A military detachment of this force participated in the Victory Day ceremonies in London on 8 June 1946, and the victory festival of Allied Forces in Jerusalem. The Desert Force (Al-Badia Force): AKA Desert Patrol. Its main task was to guard Jordan's borders with neighboring Iraq, Saudi Arabia and Syria, as well as to provide protection for the petroleum pipelines of the Iraqi Petroleum Company (IPC). Besides that, it participated in the campaigns of Syria and Iraq during World War II. This army started with an infantry company, cavalry company, machine guns unit, signal section and military band. In 1923, the total strength of the army, which was under the command of British Captain Frederick Gerard Peake, did not exceed 750 men. During 1930, the Arab Legion's strength was expanded to approximately 1,100. In 1931, a camel-mounted desert mobile force was organized under the command of John Bagot Glubb to maintain security and order. This organization attracted numerous Bedouin volunteers. In 1933, the first mechanized force was formed. This element consisted of three vehicles and 120 men including the camel-mounted desert mobile force. It undertook the responsibility of maintaining security, preventing the raids among the tribal groups and deterring the raids from the outside. By the eve of World War II, the legion had been expanded to a force of about 1,600 men. This legion took part in operations in Syria during the war. Independent companies were established in addition to a regular battalion, which was later expanded to become the 1st Brigade. In 1942, the 2nd battalion was formed, which later became the 2nd Brigade. The army continued its expansion in numbers and equipment. In 1948, it consisted of two brigades; two garrisons and four battalions were merged to become six battalions. At this time, the army consisted of an infantry division, an artillery brigade, a mortar battery, an artillery battery, an engineer and signal battalion and a field aid unit. After the announcement of the 1947 UN Partition Plan, and the disclosure of the British decision to leave Palestine on 15 May 1948, both warring sides (the Arabs and the Jews) began to make their military preparations for a forthcoming confrontation they believed would be inevitable. In May 1948, the Arab countries decided to send their forces to assist the Palestinians. The Arab Legion entered Palestine with other Arab Forces on 15 May 1948 using the Allenby (King Hussein) bridge as they were advancing to cover the approaches from Jenin, in the north to Afula and from Al-Majame'a bridge on the Jordan River to Bissan and from there to Afula. Massacre of Kfar Etzion 13–15 May 1948. Attacking and conquering Gezer (kibbutz) on 10 June 1948. King Hussein spared no pains at all to improve the army in terms of cadre and equipment, and in the early 1956 dismissed Glubb and Arab commanders assumed leadership posts in the army, most notably Habis Al-Majali. In 1957, King Hussein ordered the establishment of the 4th infantry brigade and another of field artillery. In 1958, the heavy artillery was entered, In the same year, the Armoured Brigade was recognized to become an Armoured Division and, in 1961, it become the Armour Corps. During this period, the 40th Armoured Brigade, 60th Armoured Brigade and the Royal Guard Brigade were established. On 11 September, an Israeli force infiltrated the Jordanian territories in the Al-Rahwa, Hebron sector, and attacked the police station there. After long clashes with a Jordanian unit from the Desert Guards, the Israeli force was forced to withdraw repulsed. On 10 October 1956, an enemy force, estimated at a motorized infantry brigade, supported by medium-range artillery and 10 combat aircraft, attacked the Arab towns of Hubla, Al-Nabi Illias and Azroun. The assaulting troops fought the Arab legion west of Al-Nabi Illias and were forced to withdraw to Qalqilia hills. When Kuwait declared its independence from the Commonwealth on 19 June 1961, the Iraqi government announced that Kuwait was an integral part of its national territories. Following the end of Operation Vantage, the Arab league formed the Arab Emergency Force to protect Kuwait with the participation of Saudi Arabia, Egypt, Sudan, Jordan and Tunisia. The Jordanian participation included an infantry battalion reinforced by an anti-aircraft platoon and returned home on 13 December 1963. King Hussein after checking an abandoned Israeli tank in the aftermath of the Battle of Karameh. On 13 November 1966, in response to a Fatah land mine incident two days prior, Israeli forces raided the Palestinian village of Samu (in the Muhafazat of Hebron) with an infantry brigade reinforced by two tank battalions and supported by artillery and combat aircraft. The Jordanian army suffered 16 dead, as well as material damages. In 1965, King Hussein ordered the formation of five infantry brigades. The army was divided into two fronts: Western front and Eastern front, ten infantry battalions were concentrated on both fronts. In 1967, a new armoured brigade was established. The artillery brigade was recognized to have consisted of three field artillery battalions and an anti-aircraft battalion. Believing that Israel was a becoming more of a threat, Egypt declared a state of emergency and started to concentrate its forces in the Sinai desert. In addition to that, Jordan signed a mutual defense agreement with Egypt. Consequently, Israel ordered the full mobilisation of its forces on 25 May 1967. As a result, the Arab Jordan Army was placed on maximum alert. Jordan Armed Forces (JAF): several infantry brigades, 2 Armoured brigades and 20 operational combat aircraft, distributed in defensive positions in both western and eastern fronts. Iraq: 2 infantry brigades, 1 mechanised brigade, 1 armoured brigade, and 34 aircraft. Syria: one infantry brigade crossed the Jordanian border on 7 June, and left on 9 June 1967 without being involved in any military actions. Saudi Arabia: one infantry brigade and an armoured company, which arrived at the Al-Modawara border crossing point on 21 March 1968. Egypt: 2 Ranger battalions arrived in Jordan on 3 June 1967. Their primary mission was to destroy six Israeli airfields. Due to their late arrival in the occupied territories, they could not accomplish their mission. 286 combat aircraft of different types. When the military operations were over on both Egyptian and Syrian fronts, Israel redeployed a part of its forces from these fronts to the Jordanian front. At 0730 hrs. on 5 June 1967, the Israelis surprised the Arab states with a series of continuous air strikes directed at Arab airfields. As a result, most of the Arab air force was neutralized. Amid the battles in Jerusalem was the Battle of Ammunition Hill; 71 Jordanian soldiers died. Eventually, the Jordanian Army was driven from East Jerusalem. After the 1967 war, the army was rearmed. In 1968, the army defended Jordan against Israeli troops that had invaded Jordanian territory in pursuit of Palestinian guerrillas – the Battle of Karameh. Palestinians claim a victory just for resisting Israeli troops; the Jordanians say that they forced the Israelis back; the Israelis say that they pulled back after hitting the Palestinians at which time they were bombed by the Jordanians. September 1970 is known as Black September in Arab history. In September 1970, King Hussein moved to quash an attempt by armed Palestinian insurgents to overthrow his monarchy. The violence resulted in civilian casualties on both sides. Armed conflict lasted until July 1971 ending only when remaining Palestinian insurgents were surrounded in the Ajloun-Jarash mountains, finally surrendered to the Jordan army and were expelled from the country.' In October 1970, the Ba'athist regime in neighboring Syria had attempted to intervene in support of the Palestinians by sending an armoured column into the north of Jordan. Jordanian ground and air forces were able to halt this advance and a combination of international political pressure and discord within the Syrian military led to a Syrian retreat. In the 1973 Yom Kippur War, the 40th Armoured Brigade was sent to the Syrian front. 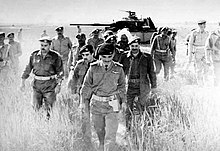 Since the major reorganisation of 1977, the Royal Jordanian Army has kept the 5th Armoured Division deployed between the Iraqi border and Ramtha on the Syrian border, the 12th Mechanized Division deployed from Ramtha through Umm Qays to the Zarqa River in a defensive posture that covers both Israel and Syria and the 4th Mechanized Division deployed from the Zarqa River, north of As-Salt to the Dead Sea facing Israel. The 3rd Armoured Division acts as both the strategic reserve and the main protection against any internal disturbances. It has units deployed at Zarqa in the north; near the capital Amman (along with a brigade of Royal Guards made up of hand-picked troops from Bedouin tribes known for their long-standing loyalty to the crown), and at Qatraneh in the south covering the route into Saudi Arabia. In 1996, the Jordanian Army finally established a Special Operations Command, the brain-child of Abdullah (then a serving Army officer). It is tasked to deal with a possible Palestinian uprising and the growth of Islamic terrorism. This powerful force now includes the 71st and 101st Special Force Battalions, the 81st and 91st Paracommando Battalions and both electronic warfare and helicopter support units." The army's organizational structure was traditionally based on two armoured divisions and two mechanized divisions. These have been transformed into a lighter, more mobile forces, based largely on a brigade structure and considered more capable of rapid reaction in emergencies. Due to the critical position of Jordan (sandwiched between Iraq, Syria, Saudi Arabia and Israel), Jordan maintains a strong defensive army, with four regional commands, the Northern command, the Central Command, the Eastern Command and the Southern Command. As of August 2004, the army was reported to be 88,000 strong, and the Northern Command is reported to consist of (2 mech, 1 infantry, 1 artillery, 1 AD brigade), the Southern Command (1 armd, 1 infantry brigade), the Central Command (1 mech, 1 lt. inf, 1 arty, 1 AD brigade), the Eastern Command (2 mech, 1 arty, 1 AD brigade), and a strategic reserve (1 Royal armoured division with 3 armd, 1 arty, 1 AD brigades). An armoured division has become the core element of a strategic reserve. Each command is controlled by its Field General, but all of the commands are under the King of Jordan's control. Currently Royal Jordanian Army is restructuring its armoured units. 80 upgraded second-hand Italian Centauro 105mm 8x8 Mobile Gun Systems and 50 German Marder 1A3 infantry fighting vehicles will equip two battalions. Challenger 1 MBTs equipping four battalions will be retired and only the M60A3s will remain in the service. His Majesty King Abdullah II is the Supreme Commander of the Jordanian Armed Forces. This authority is vested in the king by the Jordanian Constitution of 1952. He exercises the right to appoint and dismiss all members of the High Command of Jordan's Armed forces, and has the authority to exercise command and control over all units of the armed forces. The Headquarters of Jordan's military is called the Armed Forces General Command and is located in Amman. This headquarters is under the supervision of the Chief of the General Staff, who is appointed by the king. He exercises general responsibility for the day to day command, control and administration of the military and reports directly to the king as Supreme Commander. The Jordanian Army has four Regional Commands (Northern, Central, Eastern and Southern), Rapid Intervention Brigade, Special Forces Group and Special Royal Guard Command. The Army have a full range of combat and combat supporting corps, including the Royal Maintenance Corps. Today's Jordanian military ranks are based on those of the British Army, given Jordan's military heritage. The Jordanian military also contributes to UN peacekeeping missions worldwide, having sent contingents to Africa, Afghanistan, Croatia, Bosnia, parts of the former Soviet Union, and even as far as Haiti and East Timor. The Jordanian military has established a regional center of excellence with regards to special forces training, having received training from both the United Kingdom and the United States. Jordanian Special Forces have trained counterparts from Algeria, Bahrain, Iraq, Kuwait, Lebanon, Libya, Morocco, Oman, Qatar, Saudi Arabia, UAE and Yemen. 8 Tank Battalion Al-Hussein, M60 Phoenix, M577, M106A2 Two battalions per Armoured Brigade (4 Btn. - Al-Hussein), One battalion per Mechanized Brigade (4 Btn. - M60 Phoenix). 20 Mechanized Infantry Battalion (APC) YPR-765, M113A2MK-1J, M577A2, M901 ITV, M106A2, Humvee, FMTV, DAF Military Trucks Two or Three Battalions per Mechanized Brigade. 13 Self-Propelled Artillery M109A2 Howitzer, M113A2, M577A2, M901 ITV, M35, DAF Military Trucks One Battalion per Armoured Brigade or Mechanized Brigade, Three battalions per Command Artillery. 4 Heavy Self-Propelled Artillery M110A2 Howitzer, M113A2, M577A2, M901 ITV, M35, DAF Military Trucks One battalion per Command Artillery. 8 Field ADA Battalion Pantsir-S1E, Strela-10, PTRL, M163 Vulcan, ZSU-23-4 Shilka, Igla-S, 9K38 Igla Two battalions per AD Group. 5 Engineer Battalion M113A2, M35, CEV, Armoured Tracked Bulldozer (CAT D6T, D7G/R, D8R, D9, Komatsu D155A), Wheeled Bulldozer (CAT 924H, 966C/D/F/G/H, Komatsu WA300-1, WA320, WA380-3A, W470-3), excavators, graders (CAT 12G, 120M), dump trucks, Backhoe loaders, loaders, M58 MICLIC, Aardvark JSFU, M35, DAF Military Trucks, Combat Dozer UDK1 and Bomb disposal robots. One Engineer Battalion per Command. 5 Supply & Transport Battalion FMTV, M35, M800 & M900 Trucks, DAF Military Trucks, Fuel Tankers, Toyota Trucks and many other vehicles. One Supply & Transport battalion per Command. 5 Command & Control & Communication Group M577A2, M113A2, Humvee, RG-12, DAF Military Trucks One Group per Command, one Group for Army Headquarter. 5 Medical Support Group M113A2 Ambulance, HMMWV M997 Ambulance, Toyota Land Cruiser Ambulance, Mobile Field Hospitals on trucks. One Medical Support Group per command. 5 Maintenance Group M113A2, M88 Recovery Vehicle, M578 Light Recovery Vehicle, AL Monjed ARV, Chieftain ARV, YPR-806, M109 Van, M35 Trucks, M800 & M900 Trucks, DAF Military Trucks One Maintenance Group per command. 5 Construction Group Wheeled bulldozer, M35, DAF Military Trucks, excavators, dump trucks, Backhoe loaders, loaders. One Construction Group per command and General Construction Group. 5 Administrative Transport Group One Administrative Transport Group per command. 1 AFV Transporter Group Heavy Equipment Transport System, Scammell Commander Used to transport heavy equipment and armoured units. 1 Main Transportation Groups FMTV, Fuel Tankers, Water Tankers, Toyota Trucks and many other vehicles. Volunteers and conscripts receive 14 weeks of basic training in military skills and discipline. This is followed by more advanced training in weaponry and various specialities, such as artillery, communications and engineering, after the recruit is assigned to a permanent unit. Soldiers who qualify for promotion undertake courses at a general NCO school. They may then avail themselves of courses in more specialised centres where there is training in armour, artillery, engineering and logistics. Special Forces personnel are trained in a branch of the infantry school. Officer cadets are trained at the Mutah Military University, which was established in the town of Mutah, south of Amman, in the 1980s. A cadet who successfully completes the four-year course is commissioned as a second lieutenant. Advanced courses for officer training are provided at two centres near Amman – the Jordanian Staff College and the War College. Generally, officers from senior captain to lieutenant colonel attend the Staff College, where they can earn a BA degree in military science, while more senior officers study at the War College, where a master's degree is offered. Many Jordanian officers study abroad – at the US Army General Staff College, or at the British Army Staff College, and many Jordanian cadets have graduated from the UK's Royal Military Academy, Sandhurst. Members of the Jordanian Royal Family have a tradition of attending Sandhurst. The late King Hussein graduated from the college in 1952; he was followed by his son, the present ruler King Abdullah in 1981; his daughter Aisha, now head of the Royal Jordanian Army Women's Corps, in 1987; his son Prince Ali in 1994; Crown Prince Hamzeh in 1999 and Prince Hashem, half-brother of King Abdullah, in 2000. In addition, both officers and non-commissioned officers attend specialised courses abroad. The British Government arranges for senior Jordanian officers to attend the Royal College for Defence Studies in the UK. Britain's special relationship with Jordan has remained strong – this was underlined by the provision by the British Army of two short-term training teams to Jordan to advise and oversee the transition and the conversion training of the Jordan Armed Forces on the Al-Hussein/Challenger 1 tanks supplied as part of Britain's military assistance to the kingdom. British and Jordanian units regularly carry out joint training exercises in Jordan. The kingdom provides British Army units based in Cyprus with the opportunity to train in a desert environment, alongside Jordanian units. It has become a regular practice for two British Army infantry battalions based in Cyprus to exercise in Jordan every year between August and October. The US has provided significant assistance towards the training of Jordanian military personnel. Under the US International Military Education and Training Program (IMET), USD2 million was allotted to the training programme for Jordan in 2002, making it one of the largest IMET programmes of its kind in the world. The 2002 IMET grant facilitated the training in the US of more than 200 Jordanian military personnel. Jordanian personnel are trained to a very high standard and Jordan's military training has a very high reputation in the Arab world, to the extent that many Arab states (as well as states beyond the Arab world) have sent personnel to be trained at Jordan's military schools. In recent years, personnel from the following countries have been to Jordan for military training: Bahrain, Egypt, France, Lebanon, Oman, Qatar, Pakistan, South Korea, Tunisia and the United Arab Emirates. Secret military exchanges between Jordan and Taiwan, which had been going on for many years, were revealed in late 1999 after a Jordanian army NCO was killed in a parachute accident in Taiwan. Jordan has diplomatic relations with China but none with Taiwan. Reports in November 1999 indicated that Jordan sent two groups of about 10 servicemen to Taiwan every year for intensive military training, which included parachuting sessions in Pingtung County's Tsochou township, where the accident happened, jungle combat drills in Taichung County's mountainous Kukuan area, as well as winter training in the snow in Taiwan's Central Mountain Range. It was revealed that military exchanges between the two countries began in the mid-1950s, when Taiwan sent instructors to Jordan to help train its F-5 fighter pilots. The quality of instructors from the Special Operations Command (SOCOM) is highly regarded abroad, especially in the Arab world. SOCOM instructors have been providing training in Jordan to special operations troops from a range of Arab countries, including Saudi Arabia, Bahrain, Qatar, Oman, Kuwait, Libya, Algeria, Morocco and Lebanon. It is understood that Jordanian instructors have also provided training in the UAE to that country's troops. In April 2002, Jordanian special operations instructors left for Yemen to assist US forces in training Yemeni forces to fight terrorism. Jordan has set up a centre specialising in training for special operations personnel. The King Abdullah Special Operations Training Centre is based at Yajooz, Amman. In April 2004 the Jordan Armed Forces (JAF) established a new committee to further its plans for the creation of a unified national training centre. It was proposed that this combined arms training centre would group together simulation equipment for training infantry, armour and artillery personnel, from the individual to the collective training stages. Artillery and Armour training takes place in the desert area to the east of Amman and southern desert. The present day Jordanian Army is equipped with mainly Western (US and British) supplied weapons. The Jordanian Army is equipped with a mix of British and American tanks, including the Al-Hussein, Khalid and M-60 Phoenix. The older Centurion tank and M-48A5 series are phased out, as the Challenger and M-60A3 undergo further upgrades. Current projects carried out by KADDB include integration of the Phoenix digital fire and control system and a revised turret for the M-60A3 (featuring ERA of unknown origin) along RUAG L50/52 Smooth-bore Compact Gun to replace the Rifled 120mm L15A1 and 105mm L7/M68 gun of the Challenger 1 and M-60A3 respectively. The Projects have also been offered for export and existing M-60 users such as Egypt or Saudi Arabia have shown interest in KADDB. The M113A2MK-1J remains a standard APC and are being supplanted by AIFV and local vehicles, including the MAP II and Al-Temsah (Crocodile, an APC conversion of a Centurion tank chassis). 24–28 AH-1S/F 'Cobra' equip Army aviation and are equipped with TOW II ATGW and capable of night-time operations since been upgraded. Earlier the Bofors 40 mm gun was also used. Personal Equipment includes the US-supplied M-16 rifles (mainly A2 and some A3/A4), M-4A1, Taiwanese T65 assault rifles and T86 carbines, Browning HP automatic pistols; however, some units utilise the relatively uncommon Beretta Italian SS70/223 (the standard carbine of the Public Security Department and Police Force). The M-60 and FN-MAG are carried as the GPMG. The Badia forces generally carry the M-14 on camel back. United States Main Battle Tank 182 The M60 Phoenix is a Jordanian upgrade of the M60A3 main battle tank. It was developed by KADDB. Jordan upgraded four battalions with total 182 tanks. M60A1 82 36 Captured from Iran during the Iran–Iraq War and transferred by Saddam Hussein to Jordan on 1980– In storage, +20 Converted to Al-Monjed A2 ARV by KADDB. United Kingdom 392 ~ 402  The Challenger 1 (Al-Hussein) is the Jordanian Army's battle proven main battle tank upgraded by KADDB. Khalid 274 + 90  The Khalid is essentially the Chieftain FV4030/2 MBT with minor modifications to suit Jordanian requirements, currently all in storage. Jordan received 90 captured Iranian Chieftain tanks from Iraq after Iran–Iraq War but never used. Centurion 293 in storage, some converted to MAP II Heavy Armoured APC by KADDB. M577 Command Vehicle +300 Command vehicle based on the M113, 200 M577A2 received from US in 2012. HIMARS Rocket Artillery 12  12 launchers with 432 guided missiles, option for additional 12 launchers. Russia Self-propelled Air Defense According to what Jane's Defence Weekly reported in 2007 a complete Russian Pantsir-S1 short-range air-defence system was being field tested in Jordan and that the kingdom is set to place an order. Army-Technology reported that Jordan placed an order for an undisclosed number of systems. Russia Today reported Jordan as being a customer for Pantsir-S1, and that they were likely to purchase between 50–75 combat vehicles. Soviet Union 48 Upgraded to OSA-AKM – Financed by Saddam Hussein in 1982 as reward for Jordanian volunteer unit fighting against Iran. 9K35 Strela-10 50 Upgraded by JELS – Financed by Saddam Hussein in 1982 as reward for Jordanian volunteer unit fighting against Iran. ZSU-23-4 Shilka SPAAG 48  Financed by Saddam Hussein in 1982 as reward for Jordanian volunteer unit fighting against Iran. West Germany 60 60 have been bought from withdrawn Dutch surplus for 21 million dollars. Soviet Union MANPADS 182 182 Dzhigit launchers (2x Igla-S) with Sagem vision on Light vehicles. South Africa 39 39 RG-33L MRAP From US in 2012. Jordan All Terrain Vehicle 50 KADDB has already received orders for 50 ATVs. United Kingdom Wheeled Armoured Vehicle 50 Upgraded by KADDB. South Africa 0(50) On order. United States Tank destroyer 93  Numbers of M901 ITV might be much higher than 93. BGM-71 TOW Anti-tank missile 339 Jordan received 320 ITOW launchers in 1982 and 19 launchers in 1999. These launchers were removed from the M151 Jeep and modified by KADDB and re-installed on Desert Iris, HMMWV. FGM-148 Javelin 192 30 CLUs with 116 missiles delivered,162 CLUs with 1808 missiles being delivered. Russia 25,000 15,000 training units (Jordan will manufacture 60,000 Nashab units annually), the system name has been changed from Hashim to Nashab. Netherlands Radar Fire Control System 11 Eleven Thales Nederland Flycatcher Mk1 Mobile Radar Fire Control Systems and 22 40mm Bofors L/70 guns from Netherlands. West Germany Armoured Recovery Vehicles 5 Five Leopard 1 armoured recovery vehicles will be handed over to Jordan from Netherlands together with two Leopard 1 main battle tanks (MBT), which will be used for spare parts. United States Armoured Recovery Vehicles 52 22x M88A2 purchased from the U.S. Anniston Army Depot in April 2012 (to be rebuilt and, potentially, upgraded either at Anniston Army Depot or at the King Hussein Maintenance Facility in Jordan). YPR-806 & M806 Armoured Recovery Vehicles +90  24 M113 ARV received from Belgium in 2008 / 2010. +17 YPR-806 ARV received from Netherlands in 2012. Netherlands 4 ton & 10 ton Cargo truck 467 467 DAF4440/4442 and DAF YAK/YAS2300 trucks received from Netherlands. M915A2 60 60 M915A2 received from US in 2012. United Arab Emirates 9×19mm Parabellum Pistol Standard Issue Pistol. 8,000+ acquired. Jordan 9x19mm Luger Pistol Standard issue pistol for the Jordanian armed forces. Austria 9×19mm Pistol Used By Royal Guard. United States 5.56×45mm NATO Carbine Standard Issue Assault Carbine. Sold as part of a 2007 Foreign Military Sales package. Additional M4s sold as a 2008 Foreign Military Sales package. Taiwan 5.56×45mm Assault rifle Jordanian royal guards and special troops are reportedly armed with Taiwan made T86 carbines. Taiwan 5.56×45mm Assault rifle The Jordanian Defense Forces had reportedly conducted comparison tests between several service rifles in a desert environment. Germany 7.62×51mm NATO Assault rifle Standard Issue Rifle. Germany 5.56×45mm Assault rifle Jordanian Special Operations Forces employ the G36C. Italy 12 gauge Shotgun Standard shotgun. Soviet Union 9×39mm Sniper rifle Used by Special forces since 2002. United States .50 BMG Anti materiel Semi Automatic Sniper system Barrett M82A1 Varietes. .338 Lapua Magnum Sniper rifle The TRG-22 and TRG-42 sniper rifles are used by Jordanian Royal Special Forces SRR-61 (Special Reconnaissance Regiment). United States .50 BMG Sniper rifle Employed by Jordanian Special Operations Forces. United States .50 BMG Sniper rifle Used by SRR-61 (Special Reconnaissance Regiment). Germany 9×19mm Submachine gun Used by Special Forces. Germany 9×19mm Submachine gun Used by Jordanian Special Operations Forces. Germany 7.62×51mm NATO General-purpose machine gun HK21A1 variant. United States .50BMG Heavy machine gun 1,261+ acquired. In use on tripods and as flexible gun on M113A2 Mk 1J armoured personnel carrier and other armoured vehicles. United States 40mm Grenade machine gun used by Royal Guard. South Africa 40mm Grenade launcher Limited use by CTB-71 and other JSOC. ^ David Tal (31 January 2004). War in Palestine, 1948: Israeli and Arab Strategy and Diplomacy. Routledge. p. 202. ISBN 978-0-203-49954-2. ^ John Keegan. World Armies. p. 684. ISBN 0-333-17236-1. ^ "[CTRL] JORDANIAN KING TOTALLY SELLS OUT TO U.S." www.mail-archive.com. ^ "Defense & Security Intelligence & Analysis: IHS Jane's – IHS". janes.com. Retrieved 9 December 2014. ^ a b "Raytheon: Investors: News Release". investor.raytheon.com. ^ a b "Raytheon wins US$ 50 mill contract to upgrade Jordan's M60 tanks". ^ a b "Raytheon To Upgrade Jordanian M60 Fire Control System. (Raytheon Aircraft Co.)". 16 April 2004. Archived from the original on 24 September 2015. ^ a b "AML - support.gale". www.accessmylibrary.com. ^ ARG. "M60 Phoenix Main Battle Tank - Military-Today.com". www.military-today.com. ^ "Jordan to receive UK tanks". 29 October 2002 – via news.bbc.co.uk. ^ a b c d e f g h i j k l m n o p q r s t u v w x "Trade Registers". armstrade.sipri.org. ^ "Iraq Gives Captured Iranian Arms to Jordan". Los Angeles Times. Retrieved 9 December 2014. ^ "UD to Upgrade M113 Tracked Vehicles for Jordanian Armed ForcesDefenceTalk.com - at DefenceTalk". www.defencetalk.com. ^ "BAE SYSTEMS AWARDED CONTRACT TO UPGRADE JORDANIAN ARMORED VEHICLES". BAE Systems. May 12, 2009. Archived from the original on February 21, 2011. Retrieved February 18, 2016. ^ "Ratel Raw Report". 21 January 2013. Archived from the original on 21 January 2013. ^ ":: JRESCO :: - Products". 29 October 2010. Archived from the original on 29 October 2010. ^ "Alvis FV107 Scimitar Armed Reconnaissance Vehicle - United Kingdom". ^ "Artillery: Jordan Gets Its Smart Rockets". www.strategypage.com. ^ "Defense & Security Intelligence & Analysis: IHS Jane's - IHS". articles.janes.com. ^ "S. Korea to Sell Multiple Rocket Launchers to Jordan". Korea Times. Archived from the original on July 1, 2015. Retrieved July 28, 2013. ^ Administrator. "70mm Multiple Rocket System MRS Hanwha Corporation Indo Defence 2010 South Korea Korean Defence UK - Indo Defence 2010 news pictures video actualites - International defense Exhibition news pictures UK". www.armyrecognition.com. ^ "Pantsyr S1 Close Range Air Defence System – Army Technology". army-technology.com. Retrieved 9 December 2014. ^ "Jordanië koopt overtollige tanks". ^ a b c d "Dutch Cheetah air defence guns sold to Jordan - LWI - Land Warfare - Shephard Media". www.shephardmedia.com. ^ Administrator. "Desert Iris 4x4 light multi role utility wheeled vehicle technical data sheet specifications picture". www.armyrecognition.com. ^ "Vehicles shipped in support of coalition partner mission". January 14, 2012. Retrieved July 23, 2013. ^ "SOFEX 2010: Jordan to receive Jeep 18 ISVs and J8s". May 13, 2010. Retrieved July 28, 2013. ^ "SOFEX 2014 Jane's Exhibition - Jane's 360". www.ihs.com. ^ "KADDB and KIG participation at SOFEX 2012". 9 May 2012. ^ "Jordan Raw Report [Missiles & Munitions]". 8 April 2013. Archived from the original on 8 April 2013. ^ a b c "Jordan Raw Report [Guns & Air Defense Systems]". 21 January 2013. Archived from the original on 21 January 2013. ^ "Javelin Block 0". www.deagel.com. ^ a b "Jordan – JAVELIN Guided Missile Systems" (PDF). Defense Security Cooperation Agency. Archived from the original (PDF) on May 16, 2013. Retrieved July 28, 2013. ^ "RPG-26 Raw Report". 21 January 2013. Archived from the original on 21 January 2013. ^ "RPG-27 Raw Report". 21 January 2013. Archived from the original on 21 January 2013. ^ "Defence & Security Intelligence & Analysis - Jane's 360". www.janes.com. ^ "Jordans JBSP Border Security Program". ^ "Jordanian visitors choose recovery vehicles for overhaul". ^ "BAE Systems Receives $6 Million US Army Contract for FMTV Trucks for Jordan". www.deagel.com. ^ Gale, Ivan (1 July 2008). "Five companies to watch for". The National newspaper. Retrieved 2010-06-21. ^ "Modern Firearms". guns.ru. Retrieved 9 December 2014. ^ a b c d e f g h i j k l m Jones, Richard D. Jane's Infantry Weapons 2009/2010. Jane's Information Group; 35 edition (January 27, 2009). ISBN 978-0-7106-2869-5. ^ Diez, Octavio (2000). Armament and Technology. Lema Publications, S.L. ISBN 84-8463-013-7. ^ Daniel Watters. "The 5.56 X 45mm: 2007". Archived from the original on October 10, 2008. Retrieved March 25, 2009. ^ Daniel Watters. "The 5.56 X 45mm: 2008". The Gun Zone. Archived from the original on 2010-01-04. Retrieved 2009-01-27. ^ Jane's Special Forces Recognition Guide, Ewen Southby-Tailyour (2005) p. 446. ^ a b c d Shea, Dan (Spring 2009). "SOFEX 2008". Small Arms Defense Journal, p. 29. ^ a b c Special Operations Report -Spotlight Jordan Archived 2012-05-18 at the Wayback Machine Cite error: Invalid <ref> tag; name "mcmfamily.com" defined multiple times with different content (see the help page). ^ Gander, Terry (2006). Jane's Infantry Weapons 2006–2007. London: Jane's Information Group. p. 22. ISBN 0-7106-2755-6. ^ Shea, Dan (Spring 2009). "SOFEX 2008". Small Arms Defense Journal, p. 29. ^ a b Jones, Richard D.; Ness, Leland S., eds. (January 27, 2009). Jane's Infantry Weapons 2009/2010 (35th ed.). Coulsdon: Jane's Information Group. ISBN 978-0-7106-2869-5.